This is the third in a series of posts about the recently released Entity Framework Feature CTP4 (AKA “EF Magic Unicorn Edition”). Most of the samples/demos of Code First so far have focused on creating a new database that is generated from a set of classes, however Code First also can be used in scenarios where you have an existing database. For the majority of folks the existing designer/edmx based reverse engineering process (often referred to as Database First) already provides a good story for generating a model based on an existing database, with the option to tweak the object model and mapping. There are however some folks who would rather specify mapping using code than a designer. You can download the completed VS2010 project from this post. Let’s define a set of classes that we are going to use EF to map to. We want our classes to be completely independent of whatever data access technology we are using so I’m just writing my own POCO classes. Before we dive into mapping, we need to define a context to use for interaction with the database. DbContext has some smarts built in to try and help you out with managing database initialization, because we are taking care of managing the database schema we should turn that off. If we tried to use our context for data access now we’d get a bunch of exceptions because the database we defined at the start doesn’t match what EF is expecting. For example Code First has used a convention to decide that the table for Blog should be called Blogs, which is fine if we let Code First create the database but not so good if we already have a table called BlogTable. In fact the first exception we get would tell us the Code First doesn’t know what the primary key property is for Tag because it doesn’t follow the Id or <ClassName>Id convention. There is however a bunch of stuff that the conventions will correctly take care of for us, like detecting that Blog.BlogId is a primary key and set as an Identity column in the database. Let’s take a look at the mapping code we would add in the OnModelCreating method for each of our five classes. Blog is pretty simple to configure, first we are specifying that Name is a required property in the database and has a maximum length of 50. Secondly we are specifying which table it maps to and how the properties map to the columns. Notice the anonymous type projection syntax for specifying which properties are mapped to the database and what their respective column names are. On the upside this syntax is concise and reads pretty well if you look at the code, on the down side it isn’t very discoverable when you look at the method signature for MapSingleType; public EntityMap MapSingleType(Expression<Func<TEntity, object>> propertyMap). Any feedback or comments you have on this syntax will help us shape the Fluent API in the future. Post is probably the most interesting mapping, we have a few properties to configure which are just variations on code we have already seen. Next we are configuring the many to many relationship between Post and Tags, here we see the relationship API in action and also the syntax for specifying how the join table of a many to many relationship is controlled. The one to many relationship between Post and User only exposed a navigation property on Post. We can still specify that Users have many Posts, even though there is no User.Posts property, by using the parameterless overload of HasMany(). We also exposed a foreign key property on the Post class so we need to specify that Post.Author and Post.AuthorId both represent the same relationship, we use the HasConstraint method to do this. 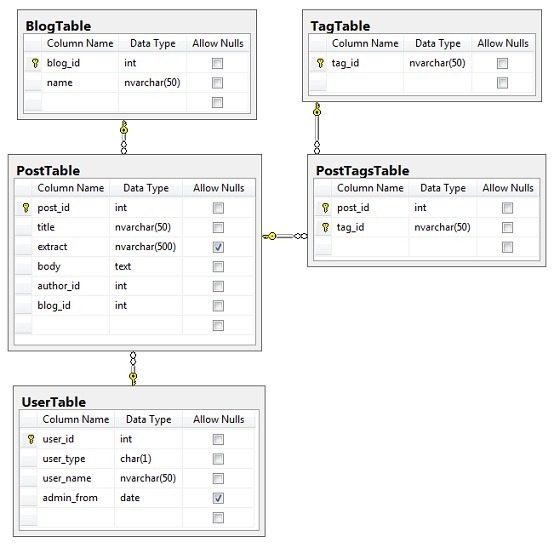 Finally we specify the table and column mappings. Note how the syntax for specifying foreign key columns differs depending on whether a corresponding foreign key property was exposed on the object. If there is a foreign key property in the object mdoel then we can just map that directly to the column (author_id = p.AuthorId), if not then we can dot through the navigation property to the primary key of the related entity (blog_id = p.Blog.BlogId). Because Tag doesn’t have an obvious primary key property for Code First to detect by convention we need to configure which property is the key. Apart from the key the rest is just a simple table and column mapping. We map User and Admin at the same time because they form part of the same inheritance hierarchy. Note that we are now using the MapHierarchy method rather than MapSingleType. We then use the Case<T> methods to specify how the two types map to the same table. We specify the values that should go in the discriminator column (user_type) by specifying constants in each mapping fragment. Also note that we don’t need to reconfigure properties as we move up the inheritance hierarchy (i.e. in the Admin block we don’t need to map ‘user_id’ or ‘user_name’ because we already mapped them for the base type). Obviously our OnModelCreating method is getting pretty huge and this is only a small model, this is where derived configuration classes come in handy. If we had a big database with a lot of tables then writing this configuration code is going to become a painful (probably unrealistic) task, in much the same way mapping a huge model to a database from scratch using the designer or xml wouldn’t be a fun task. For this very reason the designer will automatically generate a default 1:1 mapping for you as a starting point. So the logical next step would be to have something analyze your database and give you an object model and mapping code that you could then start to tweak… for a little side project I’m playing around with a generator that does exactly this, it’s not quite ready to share yet but I’ll post it up shortly. Mapping to an existing database is achievable with Code First, although the edmx/designer based Database First approach is probably a better fit for the majority of folks. If your database schema varies a lot from the default Code First conventions then you will end up writing quite a bit of code. It is possible to write a generator that will spit out a starting point to reduce the amount of code you need to write by hand, I’ll be sharing the results of a pet project on this shortly.